At one point in November planning I was going to be on my way to Columbus, Ohio tomorrow to attend the Ohio Wesleyan conference on monasticism: "Radical Gospel Living." 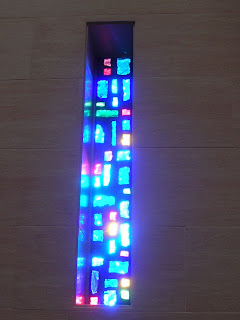 But that was before 1,000 other things came into life---not the least of which was the last 10 days: a funeral, 100+ visitors to our own weekend conference of sorts, a Monastic Council meeting, and on and on and on. Anyway, a significant contingent of representatives from our community is heading out for the event at which our Sister Joan is the Friday night keynoter. On Saturday, representing a new type of monastic life (based in downtown Philadelphia), is Shawn Claiborne about whom you can read a little here. Meanwhile back in our monastic life, we are looking forward to a weekend of blessed ordinary time--something there is not much more of since Advent is only three weeks from this Sunday---yikes! Finally, amidst all this ruckus, don't I get a surprise opportunity to try again for two impossible photographs. 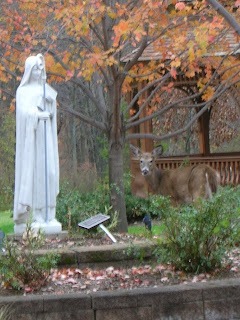 Our deer are being seen everywhere these days--this one right up near the St. Scholastica statue, nibbling on what's left of the rose bushes. 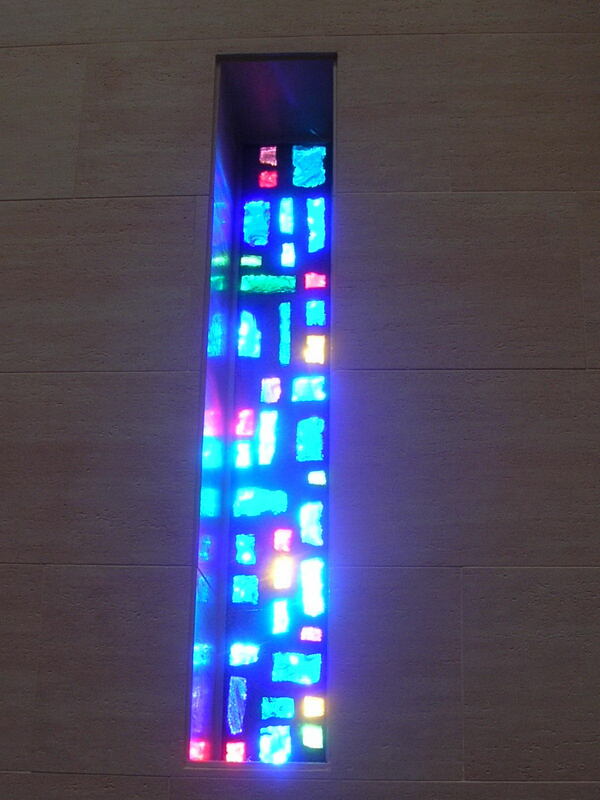 And our long, narrow stained-glass windows on the west wall of the chapel were glorious in the bright early setting sunlight yesterday....but it is impossible to catch on camera. Darn!